You love to Google, and so do we. The pet peeve (oopsie Search Engine ) has just turned 11. Starting out in September 1998, the Firm has risen from a tech initiative by a couple of Stanford Graduates to a multi billion Internet major. The Firm was started by Sergey Brin, and Larry Page as a private firm, and they have been successful to incorporate google as a term synonymous with the term 'search'. In order to celebrate the 11th anniversry, they have changed the doodle, which can be seen at the Google HomePage. Read More about them at : http://en.wikipedia.org/wiki/Google , Services by Google, Google Products, and also what we had said about Google at Google Related Posts. I was really not apprise about Googlle turns. I am happy to know about such important points of this firm. wow time has flown really fast and the big G has done so much for the internet world. I even think the guys at Google would have invented the internet had it not already been out there. They are on the edge of everything and always have smart ideas. Bloggers Payback @ You are right my friend Google has contributed a lot for improving the internet and making the internet easy for user. They are on the edge of everything and always have smart ideas. Google would have invented the internet had it not already been out there. They are on the edge of everything and always have smart ideas. This is something that more and more webmasters are doing, because of a number of problems caused by Google Accelerator and others like it. Hopefully we get many many more birthday celebrations for Google =D as its a company that deserves to be around for a very long time! Many times i have tried to open your first post. but i am unable to open it why? @Karaoke, the first post seems to open up just fine for me... Maybe try a different browser? The post opens just fine. Which browser are you using ? Please stick to the topic and don't type anything arbitrary in comments, which would be deleted. I am using Firefox, it working fine with your other posts. Congrats on 11 successful years Google. You either love them or hate them, but you can't deny how they have changed the search engine industry. I just hope someone steps up to provide competition for them to keep making improvements. Yay! Happy Birthday Google ! Everyone like the big G! best of luck google, you have done a great job and hope this continues in the future. 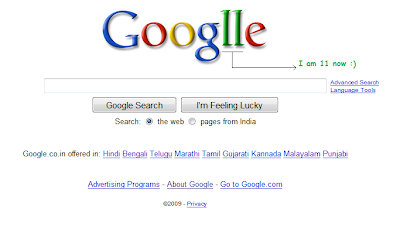 It is a little surprising that Google is already 11 years old. They have grown so quickly in the last several years that it is easy to forget how long they have been around. I remember the early days when Google was just starting to get popular. The simplicity won over a lot of people. Still, I prefer to use several search engines in case I don't find what I'm looking for on Google. i love google!!! a million times useful and i dont know what id do without it. Since internet was introduced I really appreciate how does Google makes easy for me to relevant searches. It's probably that Yahoo have wisely implemented a technique which bans accelerators from accessing it's websites. This is something that more and more webmasters are doing, because of a number of problems caused by Google Accelerator and others like it. What kind of problems could be caused by Google Accelerator? I hope this doesn't become a trend as a lot of information would be shut out from Google reducing the effectiveness of it's searches.. Web is becoming more complex and needs to get integrated & organized so OpenID, OAuth are few ways of doing it, glad to see Google backing this initiative as it’s also good for them for tracking more web pages:). It's probably that Yahoo have wisely implemented a technique which bans accelerators from accessing it's websites. This makes me feel very old. I remember the pre-Google days just like it was yesterday. I wonder what they'll come up with in the next 11 years. it doens't automatically do this. you installed something and it was in the installation as a little check box. it's easy to uninstall in programs, add/remove (depending on your os). @Aluminum: For all we know, Google might merge or buy out Yahoo and even MSN. They're expanding at a rapid rate. @classified: It's the same problem with Macromedia Flash installation. It installs McAfee too unless you uncheck it. @Jean: I rather doubt they would buy out msn or yahoo. I think their chance to buy yahoo has passed. They would have to grow immensely to be able to buy out msn. I really don't see that happening. That's the password you need to access it. You wont be able to remove it until such time it is disabled and exited from because you can't delete a program that is running. Its that way all over. This happens with every search engine nowdays. You might get better results though by learning how to use advanced search. Typing in exact phrases will cut down considerably by bypassing these sites. Advertisers simply have tons of keywords not related to their products. They are ruining the internet. Simply by using quotation marks around your search will narrow the results. Example, "chicken alfredo recipe". Open advanced search and look at some of the options. They are self explanitory. Once you catch on, you can look at the search syntax in the search window and you will learn how to use the syntax to get what you want by simply typing in the proper syntax. Try it! Its fun. You will be a pro in no time. I haven't noticed any difference in Google Search..
@AC: I think you're right. MS simply won't see MSN just like that, but there could be some sort of limited partnership deal put in place if need be perhaps. to think how much they have achieved in the last 11 years just leaves me wondering how many awesome things are to come from this massive company within the next 11 years. Can't wait to see. has anyone checked out Google in the Way Back Machine? It looks pretty amusing. Can'r wait to see what's coming in the future.